"October gave a party; the leaves by hundreds came - the chestnuts, oaks and maples and leaves of every name. The sunshine spread a carpet and everything was good. With the arrival of October, gardeners now feel that we are officially in autumn. The mornings have a cold snap to them but the days are warming up into the 70's. This is a busy month for gardeners. Harvesting is wrapping up and cool season gardening is in full swing. This is an excellent time to plant. Unless a hard freeze has occurred, summer flower gardens should still look OK with some thoughtful pruning and clean up of summer annuals. Watering is still essential and should be applied 2 to 4 times this month. Compost garden debris and leaves. 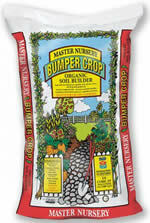 Plan to amend around existing plants, garden areas and lawn with organic products such as Bumper Crop and Paydirt. If you are a fan of Full Circle Compost products, their recommendation is BOOST your garden soil with 1/4" layer and 1" of PROTECT over the top. This is the perfect time to plant garlic. Garlic survives bitterly cold winters, grows rapidly when the weather warms in the spring, and bulbs in the summer. Ideally, is should be planted 4-6 weeks before the ground is frozen. We still have a great selection of bulbs - including daffodils, tulips, allium, crocus and specialty bulbs found only here. We are pleased to be having an apple cider press again this month on Saturday Oct. 13 and Sunday Oct. 14, from 10 AM - 3 PM. Prep your apples prior to coming - which includes washing and quartering them. It is not necessary to remove the core but do remove any worms. Bring a clean, empty container with a lid to take your cider home. It takes 14 to 16 pounds of apples to make a gallon of cider. This is approximately 36 apples. There is a $2 charge to use the press plus $2 for each gallon of cider your apples generate. In October, Santa's helpers are busy transforming the inside and outside of the Greenhouse Garden Center into a Christmas wonderland. Outside in the yard, our staff is busy getting our plant inventory ready for winter. October is still an excellent time for planting. Don't hesitate to ask our knowledgeable staff for assistance either inside or outside. What you are looking for may not be where you last saw it but we can find it for you. Greenhouse Garden Center is now taking reservations for our annual Landscape Design Workshop, which is a perfect Christmas gift for the gardener who has everything or the homeowner who is thinking about making landscape changes or landscape upgrades. APPLE CIDER PRESS, 10 AM - 3 PM, APPLES MUST BE WASHED AND QUARTERED AND YOU PROVIDE YOUR OWN CONTAINER WITH A LID. CALL 882-8600 FOR DETAILS. NEVADA DAY CELEBRATION - Yes We Are Open! Yay! Fall is finally here, with a refreshing break in the hot summer weather that seemed to go on forever. Laci and I are looking forward to fun-filled activities like her first Halloween and her first trip to the pumpkin patch. Fun doesn't stop for us just because the seasons are changing and neither should it for you. It's that time of the year when the air is crisp and the leaves are beginning to change colors. Now is the time to plant spring-flowering bulbs and garlic. I like to plant tulips every year, since they are my favorite flower. This year I will be planting 'Sunlover', a double, late bloomer which features orange and tangerine colors with a splash of red. One of my other favorites is 'Spring Green' a lime green and white tulip. Newly purchased bulbs have enough nutrients stored to bloom the first year. Once they are blooming we recommend using bulb food to improve bloom quality. Ornamental grasses are another great fall bloomer, the "blooms" being their seed heads. Greenhouse Garden Center has an excellent selection of ornamental grasses. My favorite is 'Little Blue Stem'. It grows 3 ft. tall and in clumps which will increase in diameter with each year. This time of year the blades of 'Little Blue Stem' grass will turn burgundy. 'Standing Ovation' is another breathtaking ornamental grass. This variety turns orange, red, and yellow before eventually turning brown. Ornamental kale and ornamental cabbage look great planted with pansies and violas. All of these can stand freezing morning temperatures. All of our cool season vegetable starts are ready to be planted and their bounty enjoyed. We will be open Nevada Day, so stop by and see us. We have an unique and nice selection of Nevada-themed yard art as well as fun Nevada-themed gift shop merchandise.